Starting on June 1st, SiliCycle will implement a new Enterprise Resource Planning (ERP) system. The objective of this change is to enhance the capabilities of our ERP system to better serve our customers all around the world. This change will affect our daily operations for the first week of June. On June 1st and 2nd 2017, no orders/shipments will be processed. All business operations are planned to return to normal on June 5th 2017. We thank you in advance for your understanding in any delay this may cause in processing your requests. 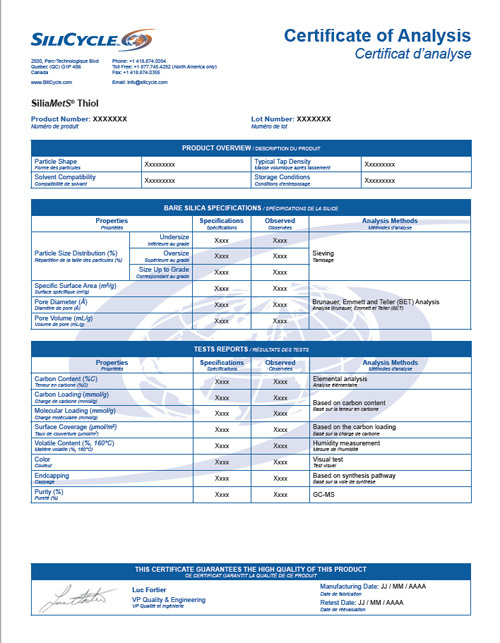 There will also be some cosmetic changes in our documentation, such as: Order Acknowledgments, Invoices, Quotes, Certificates of Analysis (CoA), and Safety Data Sheet (SDS). 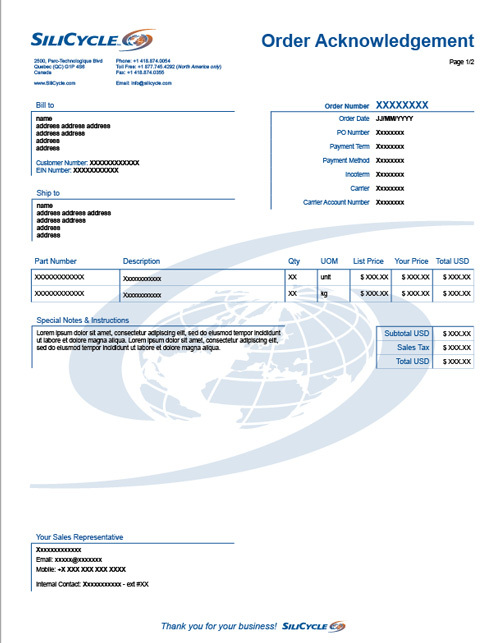 All existing customers and open orders will be automatically transferred in our new ERP. Terms and conditions remain unchanged. This system’s upgrade will allow more features on our future website such as downloadable Certificate of Analysis (CoA) and Safety Data Sheet (SDS). Do not hesitate to contact your Account Manager or Customer Service Representative, should you have any questions. Please distribute this communication within your organization to those who will be impacted by the upcoming changes within SiliCycle. CoA will have a different bilingual layout. A "Product Overview" section is added to give information on solvent compatibility, storage condition and typical tap density. "QC Acceptance Date" is changed for "Manufacturing Date" and the date is now written as follow Day / Month / Year. When applicable, a "Retest Date" is added which represents the shelf-life of the product. Once our new website will be available in Fall 2017, SDS will be downloadable directly from it and won’t be shipped with the order. The layout will also be different. All these documents will have a different but harmonized layout. All information currently present on these documents will continue to appear. The product that you are buying from SiliCycle is the same and not changing. 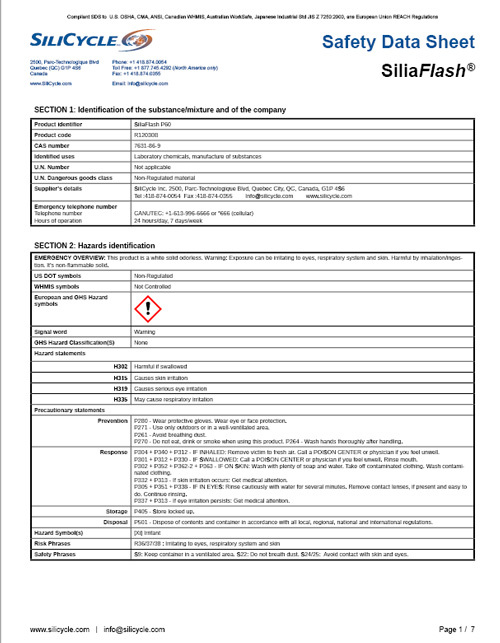 However, some additional information is added inside the description. Product number is not changed.